I've kind of had it with the cult of celebrity in this country. It appears that Armageddeon is about to occur as Brangelina has finally become oversaturated in the media and hopefully is on the wane. How about those sorry excuses for parents, Jon and Kate? I am pro-family, but seriously these people have no business raising kids and doing such a poor job of it in the public spotlight. I am going to start paying TLC to stop broadcasting these nitwits. Even our current President and his movie star wife have moved to a stratospheric level of celebrity. First, a "night out" to New York City for dinner at Blue Hill and a Broadway show. Followed up by the world's most publicized romantic "date night" the next week in Paris. Isn't it enough already? I am ready to put a dish towel over my head, roll up into a fetal position and eat a TV dinner. But perhaps my biggest beef with the whole celebration of the famous is occuring around the cooking world and "celebrity" chefs. Mind you, I am not resentful of anyone's success but these days you can't swing a prosciutto around without hitting a well known culinary master. I thought I would have escaped all of this attention moving to the quaint little town of Mill Valley outside of San Francisco several months ago. Nice. Quiet. People mind their own business here. That is until Tyler Florence of Food Network fame moved to the neighborhood and set up shop in town. Tyler Florence Mill Valley graces the downtown, a pleasant ode to good cooking. Sort of a cross between a Sur La Table and a Pottery Barn. I met Tyler in his store and ran into him at jury duty (seriously) a few months back. A nice man with a lovely family. Until his fork was stolen. You see, he has two 6 foot forks above his store entrance as part of the signage. The local press was aghast. "Dude, Where's My Fork" screamed the headline of the Mill Valley Herald (see the photo and story here). Worse than that, Mr. Florence realized the minor press goldmine this likely end of year senior prank has provided. He started twittering about it with posts like "All right guys, someone stole one of the forks off the front of my shop. WTF?" I am just not going to escape this, am I? I really like things that are understated. And tasteful. Food. Design. Art. Architecture. People. No need to scream all the attention in the world towards whatever you are doing/hawking/feeling every chance you get. Ina Garten, subtely promotes herself this way. Although certainly a celebrity by any measure, with several successful cooking shows, cookbooks and a cooking product line to point to. She walks a fine line in regards to overexposure, seemingly doling herself out in reserved bits and pieces. More my speed. And there is definitely no need to publicly position yourself as the world's leading authority on any given food topic either. I was watching superstar chef, restauranteur and author Michael Chiarello of NapaStyle and Food Network fame gumming about how to properly salt a dish on one of his shows. The overly confident Mr. Chiarello has a near religious devotion to using gray salt (sel gris) on virtually everything. He talks about it incessantly. Walking into his flagship store NapaStyle, a cross between a Williams-Sonoma and Pottery Barn, one can't help being taken aback by the sheer number of different types of salt he has for sale. Black Salt. Hawaiian Lava Salt. Himalayan Pink Salt. A Jihad of salt. And this man suffers from overexposure. His other cooking shows including Easy Entertaining, and the new Top Chef Masters series on Bravo TV, all while launching his latest restaurant, Bottega, gives him ample opportunity to throw salt on everything (one). Don't get me wrong. I respect the man as a chef, he is very talented. But the constant din of selling the brand is getting to be too much. My birthday came and went a few weeks ago and my parents thoughtfully sent me a cookbook for a gift as I am a big collector. I chuckled when I opened the package - "At Home with Michael Chiarello". I thought to myself "There is no getting away from this now, is there?" Thumbing through the book a week later I decided to cook something out of it as my parents would be visiting for the weekend. A nice gesture I thought, put the star chef's cookbook into action. My mom called. "Honey, you'll never guess who we just met?" she screamed joyfully through the phone. "We just had lunch at Bottega in Napa Valley and Michael sat down with us for 15 minutes". "Oh", I said sounding half excited and half reaching for a TV dinner. "And we're bringing you his pink Himalayan salt!" All that said, I really like Mr. Chiarello's approach to desserts. Simple. Understated. Not overly pushy or fanciful. I am not a big dessert maker, and definitely not a proficient baker as I have written about previously here. I decided to make his olive oil cake with marmalade to balance Ina Garten's Provencal Style Goat Cheese and Tomato Tart for dinner. This was a true success. Flavorful. Moist. Slightly different but delivering satisfaction in every bite. A real celebration. Making and eating it made me feel like a star all while watching TV while having dinner. Preheat oven to 350 degrees. Oil a 10 inch cake pan and set aside. In a non reactive sauce pan reduce orange juice over medium heat by half, about 6-7 minutes. Season with salt and set aside to cool completely. Sift flour, baking soda and baking powder into a medium bowl and set aside. In another medium bowl beat one egg using a mixer with a paddle or hand mixer until combined. Discard half the egg mixture. Add the second edd to the beaten egg mixture and combine until blended well, about one minute. Add the olive oil, milk, sugar, brandy, orange juice, lemon zest, and rosemary. Combine with the mixer, about one minute. Stir in dry ingredients until just combined. Pour into the prepared cake pan. Tap the pan on the counter 2-3 times and then bake in the oven until set and a toothpick comes out clean, about 1 hour. Remove cake from oven and allow to completely cool on a rack. Run knife around the edge of the pan and turn out onto a plate. While the cake is baking, wash and dry the lemons. Cut them in half and juice them, reserving the liquid. Using a melon baller or a spoon, remove the remaining pulp and white pith from the inside of the lemons. Cut the lemons into 1/8 inch strips. 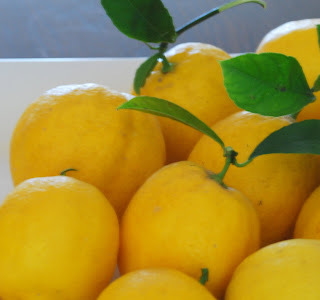 Place lemons in a non-reactive sauce pot and cover with 4 C of cold water. Bring to a boil and cook for one minute. Drain the peels into a mesh strainer and rinse thoroughly with cold water. Return the peels to the pan and repeat the same process two more times. On the last boil, drain the peels but do not rinse them. Return them to the sauce pan and add the reserved lemon juice and 1 C of sugar. Cook over a medium low heat for 30 minutes, skimming off the white foam as it cooks. Spoon the 4-6 T of the warm marmalade over the cake, spreading it all over the top. Slice and serve with vanilla ice cream. Ever since I tasted my first olive oil cake a few years ago, I have been smitten. And with meyer lemon marmalade? You know the way to an Italian girl's heart. Fabulous, I have been waiting for another post from you, Olive Oil Cake, (no Myer Lemon's here but I am sure I can find some fitting). Great post Marc. Happy Belated Birthday! A delightful cake! I cannot resist anything that has the wonderful flavor of lemons! Interesting combination of flavors! Thanks for sharing the recipe! Meyer lemon marmalade sounds so irresistible marc. For sure this cake will win so many hearts. So absolutely delicious. Too funny! Ahh, the age of celebrity, though, begs the chicken-and-egg question: Would they be so overly celebrated if the public didn't care about the minutia of their lives? In that vein, are we to blame for creating the monster of celebrity-ism? Consider that food for thought. I was prepared to dislike Chiarello from Day 1 of Top Chef Masters for the same reasons you write about (smarmy over-promotion), but his charm and food keep winning me over. 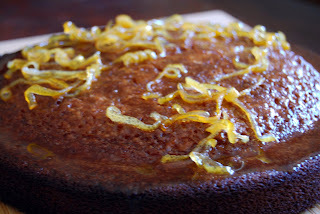 This olive oil cake with meyer lemon marmalade looks like a must-eat. Chiarello -- and you -- have done it again!